The latest teen novel from the sparkling Laura Dockrill, introducing Bluebelle, and her moving, hilarious take on food, body image and how we look after ourselves and others. 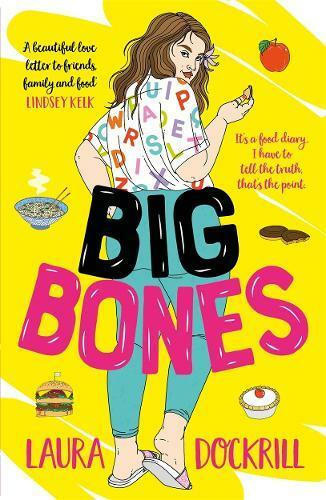 A heart-warming teen story from the unique voice of Laura Dockrill, about Bluebelle, aka BB, aka Big Bones - a sixteen-year-old girl encouraged to tackle her weight even though she’s perfectly happy, thank you, and getting on with her life and in love with food. I first came across Laura Dockrill’s unique voice with her wildly poetic mermaid duology, Lorali and Aurabel, and Big Bones is another addition to her marvellous body of work about young people who go their own (messy) way with aplomb. Bluebelle (or BB) is absolutely certain that she wants to leave school at sixteen, even though her plan to complete a barista apprenticeship at Planet Coffee is still a little hazy. BB strikes an unholy bargain to placate her concerned mum – she promises to keep a food journal (as requested by the local nurse), and to start going to the gym. Big Bones is, ostensibly, BB’s mandatory journal. Far from being an account of deprivation, BB’s journal is a defiantly lush and sensual celebration of the joys of cooking and eating. Wholesome meals cooked at home with her parkour-obsessed little sister, Dove. Happily blowing all her spare cash at restaurants with her best friend, Camille. Foods that are loved (fried rice, the perfect cup of tea, baked beans) and foods that are hated (capers and Turkish delight). BB loves her body, and devotes equally sensual attention to the way it squishes, rolls, overflows and inhabits her eye-catching outfits. The grit in BB’s life – her parents’ separation, her boss Alicia’s snide comments, the side-eye at the gym, her distractingly pretty colleague Max – mixes in with a storyline that seems rambling until a serious accident in her family brings everything to a pinpoint focus. BB finds herself vulnerable and forced to take a hard look at herself, when she already thought she had everything figured out. Eschewing tired and simplistic transformation narratives, Big Bones is a funny and heartfelt story full of smart, snarky humour, and thoughtful commentary on what it is to be a teenage girl in the modern world.